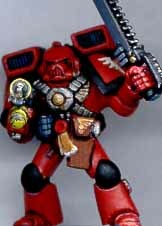 Just a few examples of Blood Angels- I'm sure everyone has seen plenty of GW BA models! This is a simple conversion my friend made and I painted. 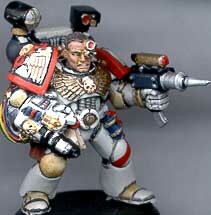 The plasma gun is from one of the older plastic ork weapons sprues (which also had a nice plastic meltagun), added to a metal assault marine. 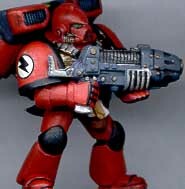 Considering how popular they are, it's funny that I don't actually have any Blood Angels of my own! These belong to a friend, but I painted them for our first Marine campaign- pretty basic, but I like the way they came out. 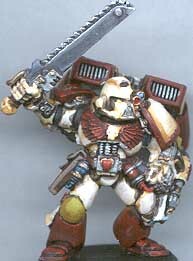 I used a dark red, and the detailed bits have a wash on them, but otherwise this is a very simple paint scheme. I'll try something more elaborate some day, but for now they work well enough! 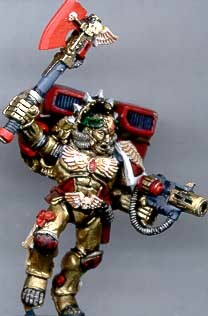 My friend supplied his Dante model primed with a gold metallic spray paint. Skeptical at first, I painted the red, white, etc and did a HEAVY brown wash on the gold bits, and it actually came out quite well! The white bits are washed with light brown, and I darkened the red for some of the details (like the blood drop). All things considered, I'm lucky that it came out as nice as it did considering how quickly it painted up! Be sure to check into other spray paint colors for possible priming ideas. 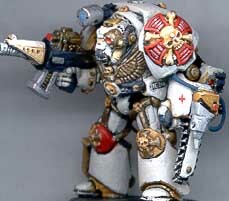 My medic models don't have chapter markings on them to make them more useful in our campaigns. I scratch built a needle pistol for this model, using an old plastic scout bolt pistol and an old plastic ork stikkbomb with the handle filed down to a point. I prefer brown washes on white, but used them selectively on this model to emphasize details like the knees, elbows and feet. 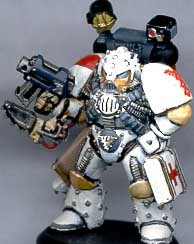 This converted medic started as a Mk. 5 marine. I added a medic pack, pouches and cases, and a reductor on the right arm made from an old plastic epic knight chainsaw arm. I found a nice decal for the shoulder, and painted the red stripe and red cross to emphasize the "medic-ness" of the model. Again, I have selectively washed the white with brown, and used a black wash to make the joints stand out. A Terminator medic? Why not! I started with an old style metal sergeant and replaced the right arm with an Inquisitor arm (yes, we let our Medics take Needle Pistols). I used a chainsword arm and added some detail bits to represent the reductor. A light scope, tubing, and a suitable paint scheme finish off the conversion.